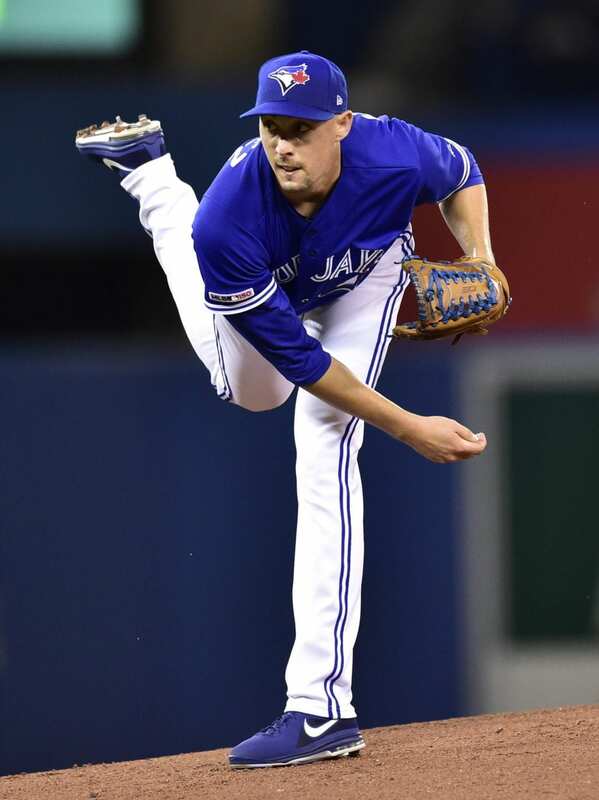 Aaron Sanchez and four relievers combined to pitch Toronto’s second straight shutout, leading the Blue Jays over the Detroit Tigers 3-0. “I was just trying to match what the other two guys did the two days before me,” Sanchez said. Toronto got seven shutout innings from Marcus Stroman on opening day, but lost 2-0 in 10 innings. Toronto won 6-0 Friday behind seven scoreless innings from newcomer Matt Shoemaker. Sanchez (1-0) allowed three singles, struck out six and walked three in five innings. Sanchez’s outing extended Toronto’s record streak of consecutive scoreless innings to begin the season to 19. The previous record was eight, set by Jack Morris in 1992. The AL ERA champion in 2016, Sanchez struggled with persistent blister issues in 2017, then suffered a bizarre injury last June when the middle finger on his pitching hand got caught inside a suitcase. “It’s great to have him healthy,” Toronto slugger Justin Smoak said. Detroit’s two runs through the first three games of the season are their fewest since 2003, when they also had two. The Tigers lost 119 games that season, a franchise-worst. Tigers first baseman Miguel Cabrera left after being hit on the right hand by a pitch from Sanchez to begin the sixth. X-rays were negative. “We’ll see how he is tomorrow” Gardenhire said. Cabrera had been scheduled to start as the designated hitter in the series finale. The slugger flashed a thumbs-up when asked afterward how his hand was feeling. Smoak hit a two-run homer and that was plenty for the Blue Jays. Toronto limited Detroit to five hits. Buckets were placed below a leak that was dripping onto the warning track in right center field before the game, and blowers were used to dry the turf before first pitch. At least two other leaks were dripping into the seating areas. Last April, the Blue Jays had to postpone a game against Kansas City after chunks of ice falling off the nearby CN Tower punctured holes in the stadium roof. A large-scale roof repair is ongoing, and is expected to last until June. Toronto last posted consecutive shutouts in September 2016, doing it against the New York Yankees. Be the first to comment on "Sanchez, Blue Jays Pitch 2nd Shutout In Row, Top Tigers 3-0"